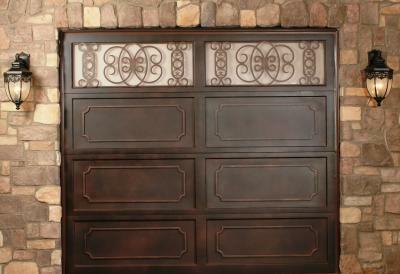 Signature iron Doors can build doors of any size for you. This is a door we built on the smaller side of the garage door scale for a client in Ahwatukee Arizona. Our Cortina style doors leave a great first impression with their solid yet regal style. All of our technicians are trained in welding and forging and every piece is inspected by our shop manager throughout the production process as to ensure your door is produced in perfect condition. Call us and come by our showroom in Phoenix Arizona to set discuss your home’s iron garage door possibilities.